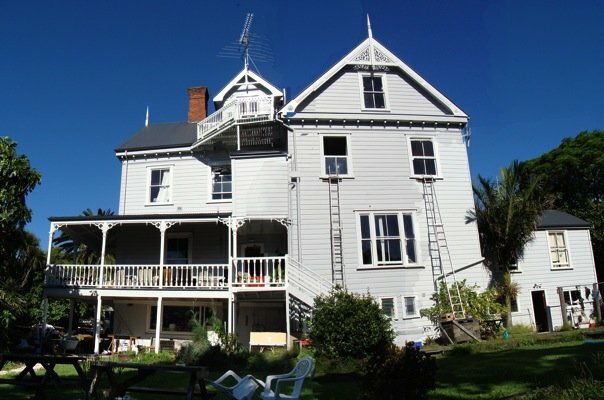 Around 10 or 11 years ago, in my hometown of Auckland, New Zealand, I was in need of a place to live, and heard from a friend about a beautiful old house with a large garden, available to rent, not far from town. With only a little embellishment, I told the landlord that I was a responsible young professional, as I had a stable job working for for a reputable firm (at the time I was the production runner on the [ahem] critically-acclaimed TV show Power Rangers). I also told the owner that I already had the perfect group of other responsible young professionals, keen to move in with me. So they let me have the house, and suddenly I had two weeks to find at least 8 housemates to share this huge place with me. Somehow, thanks to helpful friends and the magic of MySpace, it happened, though responsible young professionals these were not. I had found 8 guys and one girl, who stretched the entire spectrum from unemployed to underemployed. We had members of three different bands, with 12 guitars and two drum kits in the house. 2 of the guys were keen skateboarders, who would have races down the long wooden hallway. Sid was my favourite. He wore Mötörhead t-shirts with the arms cut off to show his tattoos. He had a blond mullet haircut, and a pickup full of motorcycle parts. Sid liked to give me impromptu early morning lessons on the intricate differences between death metal, black metal and speed metal. I lived in this house for 9 chaotic months before things completely fell apart. Half the housemates were behind on rent, the house had been broken into a couple of times, the neighbour downstairs – did I mention there was a grumpy old woman living downstairs? She was calling the landlord 5 times a week, and the landlord was calling me. All the bills were in my name, and I spent every moment dealing with various crises in the house. Eventually I kicked everyone out of the house, including myself. And I vowed never to live with more than 4 people ever again. But that’s when I came across the Big House. So I went from a chaotic, stressful existence in a house of 10 people, to a wonderful, caring community of 21 people, where each person’s duties were clear and we had ways of solving problems. I signed up to be in charge of bread – I had to keep an eye on things, and make sure to buy or make enough bread so that everyone could have their morning toast. I got a $10 per week reduction on my rent for this. Other people took care of bills or other regular duties. 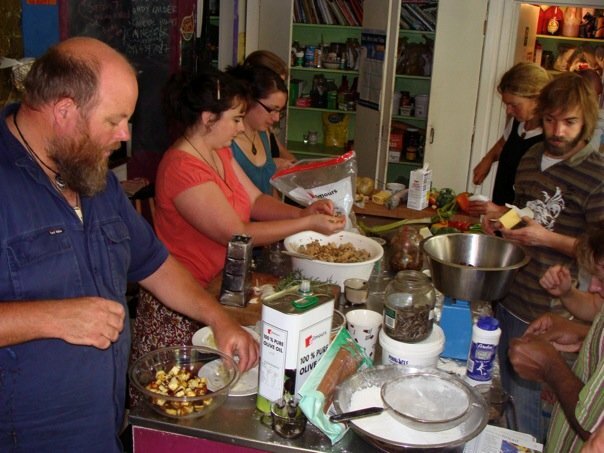 In teams of three, we cooked dinner for the whole house each night – My team would cook on Mondays, and 6 days a week we could experience all sorts of different flavours and dishes from around the world. And in the rare event of a complete food disaster, you could always quietly wander down to the local burger joint, 5min away. There were weekly house meetings where important decisions could be debated, like which brand of washing powder we should buy. Each Wednesday the chore wheel would turn and we would each have a new task to do: cleaning the upstairs bathroom, tidying the balconies or sweeping the front driveway, for example. On Thursday, housemates who hadn’t done their chores had their names written on the blackboard and were fined $15 on top of their rent. Anyone with a bit of spare time or who needed some extra cash would jump on the unclaimed chores and earn that $15 for doing them. There were all sorts of interesting systems in the house which kept things ticking along, which allowed small annoyances to be discussed rather than letting them bubble over into big issues, and which made it a loving home. So comparing this existence with my previous house, I came to my first big revelation about coordinating groups: success or failure are not so dependent on the number of people involved, but rather the design of the system through which people communicate, and how decisions are made. But over the next year or so I became frustrated that things didn’t always work quite as smoothly as they could have – some people who were new in the house often didn’t know what needed to be done, or didn’t feel empowered to make decisions. I mean, we had hand-written records of weekly meetings stretching back to 1980s, but who would ever want to dig through that pile of musty old books? At the same time, people who had lived in the house for 5 or 6 years, or more, couldn’t always be bothered providing the information, or could shut down discussions by saying “look, we actually talked about this a couple of years ago, and we agreed that it wouldn’t work, ok?”. This lead to a huge power imbalance when it came to decision-making. The key element which allows for good communication, for fair decision making, is transparency and easy access to information. So soon, we were working on a wiki on the house intranet, with digital records of meetings, spreadsheets, the history of the house, and even recipes from the more successful kitchen experiments. We didn’t question whether it was worth us spending our time on our wiki project, as this kind of behaviour was a bit of a theme in the house. 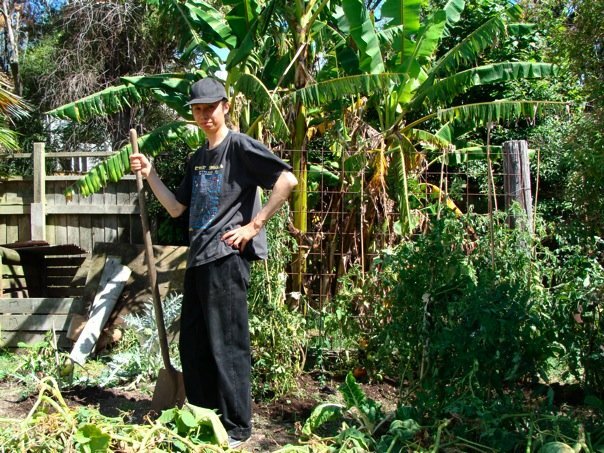 I remember thinking once, when we spent the whole weekend planting trees in the orchard – hey, I just rent here – is it strange that I’m so enthusiastic about planting trees whose fruit I will likely never eat myself? I mean, I was happy living in the Big House, but I wasn’t going to be there forever – the call of the rest of the world was pretty strong. I knew that it was much more likely that in 10 years I would be living somewhere in the south of Spain, or spending my time in some other warm and exotic place overseas, or maybe, if I was really lucky, a draughty warehouse in Neukölln. But I wanted to plant trees because I knew that my life in the Big House had benefited greatly from all those residents before me, who had planted trees, or developed governance structures, or painted the TV room weird colours, hoping that their contribution would make the house a better place, for them, and for future residents. People are very happy to contribute in a reciprocal manner – if you have experienced particular benefit, you’re happy to benefit others in the same way, especially if you are convinced that your contribution is not in vain. I knew that I wouldn’t be living there in 10 years, but I did know that the Big House would still be there, with 21 different residents, still arguing over which type of washing powder to buy, and eating avocadoes from the tree that I planted back in 2007 (in slightly the wrong place – sorry!). I knew this because the Big House had a resilient legal and governance structure, and it had collaborative systems that worked. And yes, it’s still going strong today. Once I left the Big House I read up a lot more on collaborative systems, I discovered that what we had been doing on the house wiki was called ‘open source’, and when I came to Berlin, I spent a year applying this open source concept to every aspect of my life, exploring how it works, or how it could work, in areas like furniture design, cellular networks, clothing, music and even beer. Through that project I met my colleague Lars, and he met Alice, and with 3 others we started a project, OSCEdays, applying open source to the development of a sustainable, circular economy. And that brings us to this space that Alice, Simon and their team have set up and invited us to today – Agora Rollberg, the Circular Lab. A big house for the open and circular community in Berlin, aiming to have collaboration, sustainability, and the open source principle at its heart. It’s still early days, and there’s a lot of growing still to do, and maybe we don’t have everything perfect right now, but that’s ok. I hope that it will evolve fair systems for communication and decision-making, and that transparency and easy access to information are at the core of its processes, and I hope that it is a space in which people will experience the spirit of generosity, and that they can trust that it will live on long into the future.I hope that we can all contribute ideas and energy to form it into a space and a community, that really lives these open source principles, and that all voices are heard and welcomed. This space should be an ongoing knowledge commons that it can live on and benefit many more people in the future, and to do that successfully, we must learn from other open source endeavours in the past. So tonight, it is an open space for all of us to share our stories, learn from one another, and discuss the really juicy aspects of open source collaboration. Thank you for listening to my story, and I’m looking forward to hearing yours.